The luxurious King Spa Suite provides an exceptional standard of accommodation at the best location in Canberra, only minutes from Barton, Manuka & Parliament House!! The King Spa Suites boasts a king sized Dream Bed, along with a separate wet bar area, segregated living area perfect for relaxing in, affordable, high speed, secure broadband Internet access billed by the minute to a capped rate for 24 hour access, air conditioning, mini bar, tea/coffee making facilities, colour TV, in-house movies and a modern marble bathroom with large corner spa bath and quality fittings. The comfortable lounge area provides guests with an ideal location for relaxing, Rates are for 2 guests. Maximum 3 guests. Extra guest charge $50.00 per night. Enjoy a perfect night's sleep on a Dream Bed in a superior room.In a queen room equipped with writing desk, broadband internet facilities, pay movie and Foxtel channels. Enjoy a night on a Dream Bed in a Superior Room configured with either 1 queen bed and sofa bed or 2 double beds. Includes a Full Hot Buffet Breakfast in the morning and recieve two FREE coffees OR Hot Chocolates! Perfect to beat the chill. On the way to the snow, stop in at Capital Hill & enjoy overnight's accommodation in a superior room. Includes a 4-pack of V and 2 chocolate bars for the whole family! overnight accommodation in a superior queen room, your choice of either a bucket of Coronas (4 per bucket), or a bottle of the newly released Leila 2008 Vintage Sparkling Sauvignon Blanc & choice of 4 items from the tapas menu! Enjoy a night on a Dream Bed in a Superior Room configured with 1 queen bed and sofa bed. Includes a local discount card valued at $55 for local restaurants as well as tourist attractions. Enjoy overnight's accommdation and buffet breakfast for 2. Includes 2 x Tickets to the McCubbin "Last Impressions" Exhibition at the National Gallery of Australia. More spacious than a typical hotel room. Includes a choice of king bed or two single beds, ensuite bathroom, well lit work station with ISD/STD modem access, minibar, tea and coffee making facilities, access to inhouse movies, individual air conditioning units and windows that open for fresh air. Winner Best Hotel/Resort Group, AFTA National Travel Industry Awards for Excellence 2008. Featuring 1920's style decor and charm these rooms contain a Queen and Single bed, private ensuite facilities, reverse cycle heating/cooling, hair dryer, clock radio, mini bar, Color TV, Foxtel and STD and ISD phones. Featuring 1920's style decor and charm these rooms contain a Queen size bed, private ensuite facilities, reverse cycle heating/cooling, hair dryer, clock radio, mini bar, Foxtel and STD and ISD phones. These newly renovated rooms contain a Double bed, private ensuite facilities, mini bar, Color TV, hair dryer, clock radio, reverse cycle heating/cooling and STD & ISD phones. Pleasant room with all modern facilities for a couple. Rooms have a double bed. Rate is for 2 guests. Extra guests incur a $25 surcharge. Well presented room with all modern facitlities. All rooms have been recently renovated. Rooms have 1 double bed. Rate is for 1 guest. Extra guest incurs a $25 fee. The motel is opposite a park and offers a very quite environment. Includes Full Cooked Country Breakfast for one in Isabella's Restaurant.FREE Foxtel plus pay per view movies,WiFi and internet in room. Deluxe room.Access to indoor heated pool,spa,sauna and gym.FREE Foxtel plus pay per view movies,WiFi and internet in room.Restaurant and bar.Free parking.Next to clubs and shops. Deluxe View room with opening door to balcony or external grassed area.Pay To View movies & internet plus Free Foxtel in room.Access to Indoor Heated Pool,Spa,Sauna and Gym.Queen bed only. All spa suites have balconies with views of the brindabella ranges.FREE Foxtel plus pay per view movies,WiFi and internet in room.Access to indoor heated pool,sauna & gym.Queen bed only. MUST STAY AT LEAST 2 NIGHTS!!! N.B.Cannot be cancelled in part.Fri,Sat,Sun only. Deluxe room.FREE Foxtel plus pay per view movies,WiFi and internet in room.Access to indoor heated pool,spa,sauna and gym.Restaurant and bar.Free parking.Next to clubs and shops. Delightful garden room featuring our new 'DREAM' latex ensemble bed (a double bed and one single bed), workstation, vingcard security with energy control, split air-conditioning, complimentary in house movies, direct dial telephone along with wireless broadband Internet access, mini bar, refrigerator - bar size, tea & coffee making facilities and private bathroom facilities. Rates are for 2 guests. Maximum 3 guests. Extra guest charge $40.00 per guest per night. Complete with contemporary furniture, this room consists of the new 'DREAM' latex ensemble bed, sofa lounge, workstation with executive chair for business travellers along with wireless broadband Internet access, LCD Television, vingcard security with energy control, split air-conditioning, direct dial telephone, mini bar, refrigerator - bar size, tea & coffee making facilities and private bathroom facilities. Rates are for 2 guests. The room caters for a maximum of 2 guests. Consists of our new 'DREAM' latex ensemble bed ( your choice of either 2 single beds or 1 double bed & 1 single bed - please specify your preference when booking), workstation, vingcard security with energy control, split air-conditioning, direct dial telephone, complimentary in house movies, mini bar, refrigerator - bar size, tea & coffee making facilities and private bathroom facilities. Rates are for 2 people. Maximum 2 guests. Listed by the National Trust, ensuites, offer all the essential amenities with the charm of yesteryear. Twin room are limited to requests, Built in 1927 and listed by the National Trust. All rooms have an ensuites and offer all the essential amenities with the charm of yesteryear. Heritage rooms have a double bed Alarm Clock Bar Fridge Broadband Internet Access Daily Room Service Double Bed Hairdryer Iron/Ironing board Linen and Towels Provided Non-Smoking Room Service Shower over Bath/Spa Telephone Television Tea/Coffee Making Bedding configuration is on request and cannot be guaranteed. Rates are for 2 people. The room caters for a maximum of 2 adults. Enjoy the convenience of being centrally located in the nations CBD. Our King Rooms feature; one spacious king size bed, private ensuite, free movie channels, coffee/tea making facilities and complimentary full buffet breakfast. Stay in one of our newly renovated modern Executive Rooms and enjoy the Free buffet breakfast. Features include; luxurious Rex Cloud Bed, spacious modern bathroom with walk-in shower, LCD TV, Free movie channels, desk, Free cable TV and Free Wi-Fi internet access. Enjoy the convenience of being centrally located in the nations CBD. Our Queen Room features; one queen size bed, private ensuite, free movie channels, coffee/tea making facilities and an all inclusive full buffet breakfast. One of the newest additions to the property, the Woodland 1 Bedroom Cabin was added in July 2008. Fresh, new and modern, the Woodland Cabin is a well appointed cabin non smoking featuring 1 seperate master bedroom with 1 Queen Size Bed, a private ensuite bathroom with shower, toilet and vanity, a seperate lounge area with LCD flat television, wireless broadband internet access and DVD player, reverse cycle heating and air conditioning, a full and well equipped kitchen including a full size oven and cook top, microwave and fridge with freezer, radio, alarm clock, ceiling fans, iron & ironing board. 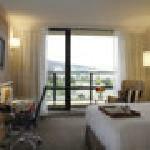 Ideal for a couple or individual visiting Canberra on business or leisure. Most cabins have an unspoilt view of Telstra Tower. Free car parking is alongside the cabin. All linen and towels provided. Please note that the cabin is not serviced on a daily basis. The rate is for 2 guests. Maximum occupancy is 2 guests. The Executive King/Twin Room is a spacious non smoking room, delightfully furnished with contemporary furnishings, including either 1 King Size Bed or 2 Single Beds - please specify preference in the Special Requests Section of your Booking, a private ensuite bathroom with bath and shower, bathrobes, desk, in-room safe, hair dryer, mini bar, FREE in-room unlimited broadband internet, direct dial phone, colour TV, FREE Foxtel 11 channels (including movies, sport, news, history and entertainment), in house movies, in-room safeair conditioning, heating, radio, alarm clock, tea and coffee making facilities, wake up call, iron and ironing board. The rate is for 2 guests. Maximum occupancy is 3 guests. Extra guest charge is $35.00 per night. The King/Twin Room is a spacious non smoking room, delightfully furnished with contemporary furnishings, including either 1 King Size Bed or 2 Single Beds - please specify preference in the Special Requests Section of your Booking, a private ensuite bathroom with bath and shower, bathrobes, desk, in-room safe, hair dryer, mini bar, FREE in-room unlimited broadband internet, direct dial phone, colour TV, FREE Foxtel 11 channels (including movies, sport, news, history and entertainment), in house movies, in-room safeair conditioning, heating, radio, alarm clock, tea and coffee making facilities, wake up call, iron and ironing board. The rate is for 2 guests. Maximum occupancy is 3 guests. Extra guest charge is $35.00 per night. NEWLY REFURBISHED ROOM .! The Deluxe Double Room is a spacious room, newly refurbished in 2010. Ideal for a single, couple or corporate business traveller, the room is modern, clean, comfortable and non smoking, offering smart furnishings and decor, an open plan design with reverse cycle air conditioning and heating, 1 comfortable Double Bed with wool-filled doona to ensure a restful nights sleep, a modern private ensuite bathroom with shower, toilet, hairdryer and bathroom amenities, LCD Flat screen TV, DVD player, FREE Foxtel cable TV ( 8 channels), direct dialling phone with voicemail, WI FI internet connection writing desk with lamp and chair, kettle, toaster, tea and coffee making facilities, fridge - bar size, plunger coffee, mini bar, alarm clock and ironing equipment. NEWLY REFURBISHED SPACIOUS ROOM .! The Deluxe Queen Hotel Room is a spacious room, newly refurbished in 2010. Ideal for a single, couple or corporate business traveller, the room is modern, clean, comfortable and non smoking, offering smart furnishings and decor, an open plan design with reverse cycle air conditioning and heating, 1 comfortable Queen Bed with wool-filled doona to ensure a restful nights sleep, a modern private ensuite bathroom with shower, toilet, hairdryer and bathroom amenities, LCD Flat screen TV, DVD player, FREE Foxtel cable TV ( 8 channels), direct dialling phone with voicemail, WI FI internet connection writing desk with lamp and chair, kettle, toaster, tea and coffee making facilities, fridge - bar size, plunger coffee, mini bar, alarm clock and ironing equipment. SPECIAL ACCESS ROOM DESIGNED FOR WHEELCHAIR ACCESS, WITH EXTRA SPACE AND PRIVATE BATHROOM WITH WALK IN SHOWER AND HAND RAILS .! The Disabled Friendly Hotel Room iis a spacious, comfortable and modern, non smoking room, beautifully appointed with contemporary decor and furnishings. Ideal for a couple, single or corporate traveller, the room features climate controlled reverse cycle air conditioning and heating with individual temperature control, your choice of either 1 comfortable King Size Bed or 2 Single Beds, a modern private ensuite bathroom with walk in shower and hand rails, toilet, hairdryer and complimentary exclusive toiletries, bathrobes & slippers, LCD Flat screen TV, FREE Foxtel cable TV, Video on Demand in house movies, CD player, Ipod docking station and Apple Mac Mini in room system, USB dock, direct dialling ISDN phone with voicemail and room to room dialling, WI FI internet connection, writing desk with lamp and chair, fridge, tea/ coffee making facilities, personal bar and private safe. SPACIOUS APARTMENT SUITE WITH SEPARATE BEDROOM, LOUNGE ROOM AND PRIVATE BALCONY .! The 1 Bedroom King/Twin Apartment Suite is a spacious (67.5 sqm), comfortable and modern, non smoking apartment suite, beautifully appointed with contemporary decor and furnishings. Ideal for a couple, single or corporate traveller looking for extra space and privacy, the suite offers climate controlled reverse cycle air conditioning and heating with individual temperature control, a seperate bedroom with your choice of either 1 comfortable King Size Bed or 2 Single Beds, a modern private ensuite bathroom with shower over the bath, toilet, hairdryer and complimentary exclusive toiletries, bathrobes & slippers, a separate spacious lounge room with lounge suite, LCD Flat screen TV, FREE Foxtel cable TV, Video on Demand in house movies, CD player, ipod docking station and Apple Mac Mini in room system, USB dock, direct dialling ISDN phone with voicemail, WI FI internet connection, writing desk with lamp and chair, a very well equipped kitchenette with full size fridge, (no stove top or oven), microwave, toaster, crockery and cutlery, dishwasher, tea/ coffee making facilities, personal bar, private safe and a private balcony, ideal for relaxing and taking in the surrounding views.The rate is for 2 guests. The room caters for a maximum of 3 guests. The extra guest is accommodated in a Roll Aaway Bed at the extra adult/child guest charge of $30 per night. Baby cots are available at an extra charge. Children aged 3 and under STAY FREE OF CHARGE when using existing bedding. Complimentary membership of club and gym facilities during your stay. Spacious and airy hotel room with own private balcony. Corner Spa in private ensuite bathroom. The Spa Hotel Room further features 1 Queen size bed, tea & coffee making facilities, colour TV, mini bar, cable TV, digital video system, modem points, telephone, working desk, individually controlled air-conditioning/heating and a secure electronic door locking system. Internet connection is available in the rooms for an extra charge. Rates are for 2 guests. Maximum 3 guests. Extra guest charge $20.00 per night. Easy distance to local restaurants. Close to Canberra's attractions.